May 1st: St Joseph the Worker, St Joseph Church Terenure, Dublin. May 6th: First Saturday, Catholic Central Library, Dublin. May 11th-13th: Apparition Centenary, Cathedral of the Most Holy Trinity, Waterford. 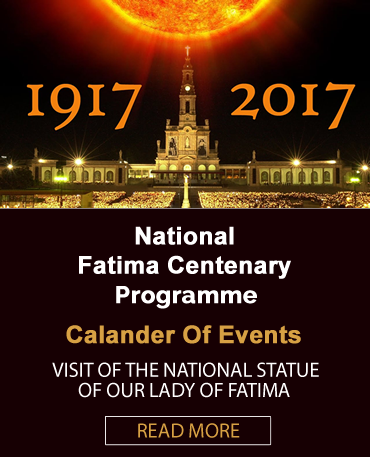 May 19th-20th: International Fatima Centenary Conference, Ballinasloe. May 21st: Our Lady of Fatima Novena, St Malachy’s Dominican Church. 2nd-3rd: First Friday/ Saturday, Black Abbey, Kilkenny City. 11th-13th: Apparition Centenary, Cathedral of the Assumption, Thurles. 24th-25th: Immaculate Heart of Mary, St Brendan’s Cathedral, Loughrea. 1st: First Sat and Precious Blood of Jesus, St Saviour’s Dominican Church, Dublin. 8th: Fatima Centenary Seminar, Knock. 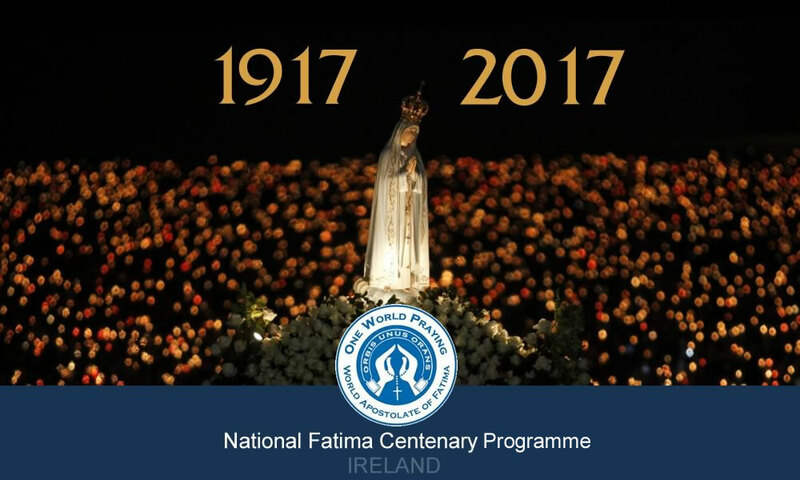 9th: World Apostolate of Fatima Centenary Sunday, Knock Shrine. 13th-15th: Apparition Centenary, Croke Park, Dublin. 16th: Our Lady of Mt Carmel, St Theresa’s Church, Belfast. 4th-6th: Fatima Triduum, Cathedral of the Annunciation and St Nathy, Ballaghaderreen. Co. Roscommon. 11th-13th: Fatima Triduum, Cathedral of the Immaculate Conception, Sligo. 14th: Fatima Evening, St. Patrick’s Catholic Church, Downpatrick, Co. Down. 15th: Fatima Day, Church of Immaculate Conception and St. Joseph, Crossgar, Co. Down. 16th: Fatima Day, St. Nicolas’ Church, Ardglass. Co. Down. 17th: Fatima Day, St. Comgall’s Bangor, Co. Down. 18th: Fatima Day, St. Peter’s Cathedral, Belfast. 19th-20th: Centenary of Delayed Apparition, Extraordinary Form, St Kevin’s Church, Dublin. 21st-23rd, Forty Hours of Fatima, St Patrick and St Felim Cathedral, Cavan. 27th: Fatima Centenary Pilgrimage to Holy Cross Abbey, Co. Tipperary. 8th: Friday – The Nativity of Our Lady, St Mel’s Cathedral, Longford. 10th-13th: Sunday Evening to Wednesday – Triduum for Fifth Apparition of Our Lady, Cathedral of Ss Eunan and Columba, Ard Choluim, Letterkenny, Co. Donegal. 15th-17th: Friday to Sunday – Triduum in Honour of Seven Sorrows of Our Lady, St John’s Cathedral, Limerick.